You can invite or remove users from the site Administration area. You can also integrate with G Suite for user and group management, as well as use your own identity provider via SCIM. Enter the Email address you want the user to log in with (you can enter more than one at a time or a string of them using a space or comma). 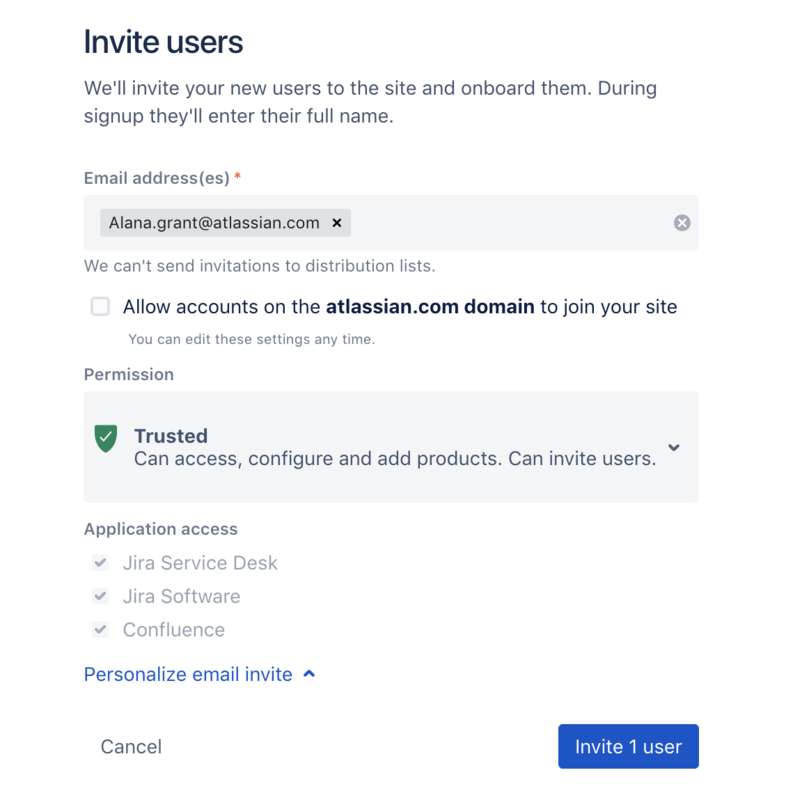 If you invite a user with a different email address from their Atlassian account email address, and they end up creating a new Atlassian account, they can't combine the two accounts. You'll need to re-invite the user with their original account and remove access for the other account. If they create any content while logged in with the second account, that content will still exist but will remain associated with their other account. Select whether you would like to allow other users with this email domain to self signup by checking Allow accounts on the <domain> domain to join your site. You won't see this option until you've entered an email address. For more information about allowing users to self signup, see Specify how users get site access. Basis – Can access specified products and apps. No additional permissions. Trusted – Can access, configure, and add products. Can invite users. Site administrator – Full admin permission for the site. Select products from the Application access list. When users get an invite, we'll add the user to the groups for the products you select, so you can always change them later. (Optional) Add the user to additional groups for your site. (Optional) If you don't want to send the Invite message, deselect Send email. When do users not receive an email invite? For these users, go to the Users page and click Resend invite to ensure these users get a invite. If you've linked Bitbucket accounts with Jira products, you can add new users to a Bitbucket group from the Bitbucket groups page. From your site's Administration, select Users.